On October 2, 2018, was Sting's 67 birthday. He is old but his body is the envy of men half of his age. 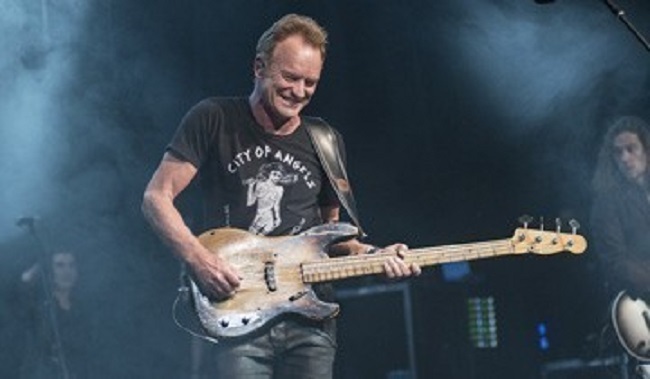 A month ago, Sting performed a two-hour hits-filled set for a full capacity crowd on Saturday night in Boston. He has great energy. Sting and his wife of 34 years, Trudie Styler, are into Ashtanga and Jivamukti yoga. Asana, meditation and rock'n'roll are Sting's life. Yoga has enriched my life by allowing me to improve physically; which is very inspiring, especially as you get older. I tour an awful lot, and being on the road is not always easy... Yoga is a great way to offset the downsides of touring by bringing much-needed peace and sanity into what can be a hectic life. Like music, yoga is a journey - one that is long enough so you keep developing, and keep learning. I don't see an end to it. Every day, with his wife or alone he does between 60 and 90 minutes of yoga before breakfast. Ashtanga Yoga requires a great deal of physical and mental effort, and it wasn't long before he became hooked. In the late 1980s, bandmates introduced Sting to Danny Paradise, a musician and Ashtanga yoga instructor from Toronto. Sting recalls that although he was fit, he couldn't do even half of the postures Paradise showed him. From that point on, Sting thought yoga was intriguing and started studying it with Paradise as his mentor. Sting was in his late 30s at this time. He has said in interviews that he wishes he started doing yoga sooner but acknowledges that he probably wouldn't have been as accepting of it when he was younger. Today, when he's touring with his band, the entire group performs yoga before the show, which Sting believes "increases our cohesion." It composes my mind; it gives me more energy, and, as a consequence, I find I am more productive. As a singer, I also think some aspects of yoga, such as breathing properly and eating well, are key to maintaining a healthy voice. So, yes, yoga is an important part of my creative life. I'm sure my lung capacity has also increased - I can certainly hold notes longer than I used to be able to. For me, yoga has become more than just exercise: It's about control, discipline, and emotion, and those are useful tools for any songwriter. After Sting had his first Ashtanga yoga session with Paradise, he immediately wanted his wife, Trudie to try it with him. In the years since, they have advanced their practices considerably, both as individuals and as a couple. Sting remains close to Paradise and often takes classes with him. 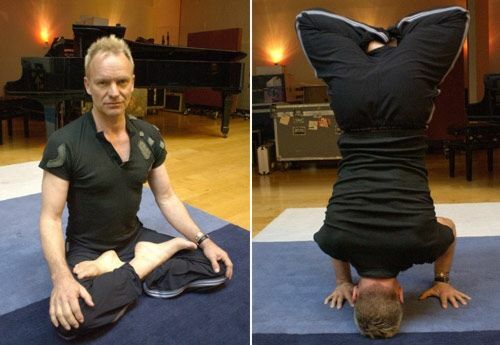 Sting and Styler are also devotees of Jivamukti yoga. Jivamukti means "liberation while living." The Sanskrit term is used to describe enlightenment.